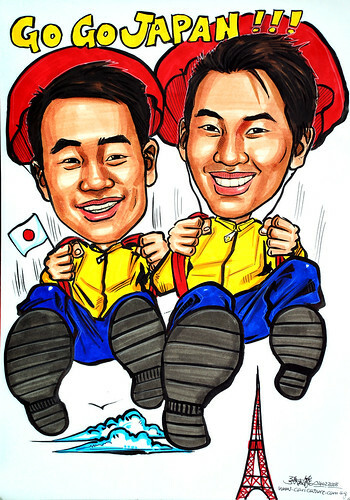 Portrait Workshop - website:www.portraitworkshop.com blog:www.caricature.com.sg: Go Go Japan!!! "...I would like the theme be in Japan tower, and my friend and I are the parachuters. And if possible add in a Japan flag. Maybe add a word "Go Go Japan " . I have attach a sample japan tower picture as well for reference. " Gave them same colour outfit. Looked more like buddies. Isn't the Japan Tower same as Tokyo Tower? Looked similar to what I have seen when I was in Japan 3 years ago. Last job before I go for my CNY holiday.